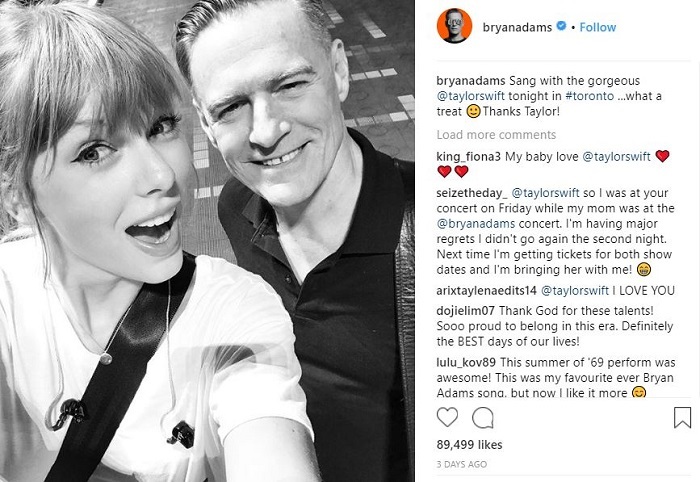 Taylor Swift fans know that every concert of the singer is special, but they were not expecting the amazing duet she performed with Bryan Adams in a memorable Toronto show. Amazing! When thinking about summer anthems, Bryan Adams' 1984 hit song Summer of 69' pops to mind immediately. Anyone who was lucky enough to grow up in the 80's was humming this song, and it's just as addictive today as the year it was released. In an amazing surprise for her fans, Taylor Swift took to stage along with Bryan Adams in her Toronto concert, and the two made for a memorable summer of 2018. The performance was an instant thrill for the audience who jumped along to the catchy rhythm. Despite the seemingly rehearsed duet, the two mega-performers decided to do the song at the last minute, as soon as Taylor found out that Bryan was in town. "I didn’t even know Bryan was gonna be in town until last night and I asked him completely last minute if he wanted to come to sing!! Pretty evident from the videos (um yes I’m posting another one) that I’m FULLY LOSING IT with excitement, and I can’t thank @bryanadams enough" Taylor wrote on her Instagram account. The Memorable performance was a once in a lifetime event, and hopefully, and fans will always have amazing surprises like this one in store for them at a live concert.